Monica Gunn was born in Swansea where her parents, Henry and Flora Gunn had come to live after they were married. Having taken a degree in languages Monica decided to explore her vocation and entered the Newry convent in 1952 where she received the name Anselm. After profession she taught in several schools established by the Order until in 1971, a completely new way of life opened up before her. Shortly after the Vatican Council the Church appealed for missionaries to work in Latin America. In 1971 when the Irish Franciscans who were working in El Salvador invited sisters to join the Friars in this new mission Sr. Anselm responded. She remembered that in the Process of Canonisation of St. Clare, Balvina, one of the witnesses said of Clare that “before she was sick, she desired to go to those parts of Morocco, where it was said the brothers had suffered martyrdom”. Clearly then, missionary activity was dear to the heart of Clare herself in the very earliest days of the Order. 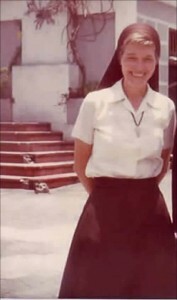 It was also very dear to the heart of Sr. Anselm and on December 3rd 1972, she arrived in the Parish of San Francisco Gotera in Morazan, the first of many of our sisters to be privileged to serve in this mission. Gotera Parish was huge, about the size of the diocese of Dromore but the towns and villages were much less easily accessible than at home. Often there were no roads and the only way to get to a place was on horseback or on foot. El Salvador was at this time embroiled in a savage Civil War and there was a great deal of suffering involved, especially for the poor. But there were great consolations too. The struggle to live the Gospel, meant for all committed Christians in El Salvador, the probability of persecution. Many of our catechists gave their lives for this. To know a martyr is a humbling experience. In the early eighties we began to get enquiries from some young people in Central America who were attracted to the Religious Life. We felt very happy to receive them and over the years several new convents have been established in El Salvador and Guatemala to cater for these new members. There are still two Irish sisters in the Region and twenty four from El Salvador and Guatemala. A small nucleus perhaps, but one full of hope and joy. 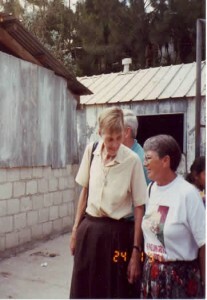 So a dream which began in Wales and which seemed destined for a career in teaching expanded in a totally unforeseen way as Sr. Anselm served the poor in Central America for thirty-four years.